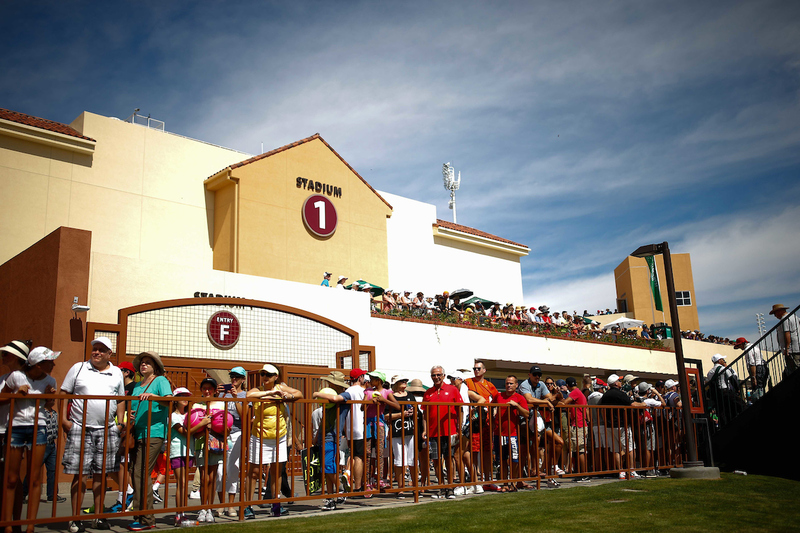 Residents of the City of Indian Wells receive complimentary Grounds Passes. For more information and to secure your ticket please visit the City of Indian Wells’ City Hall. Join us on the Village Stage for Tennis Talk with Tommy Haas today! Stop by Tennis Warehouse as Jamie Murray joins fans for an exclusive autograph session. Stop by Tennis Warehouse as Danielle Collins joins fans for an exclusive autograph session. Stop by Tennis Warehouse as Daniil Medvedev joins fans for an exclusive autograph session. A percentage of single tickets sold for evening sessions is donated to The Champions Volunteer Foundation and other local charities. Take advantage of this special $20 ticket and show your support as you enjoy great tennis and special evening entertainment on the Village Stage. Join us for a live DJ, passed refreshments and a Q&A with John Isner and Karolina Pliskova. Learn about FILA’s newest on court styles and admire the FILA x BNP Paribas Open collab shoes, only available at the FILA Store in Tennis Paradise. Join us at the Tennis Warehouse demo court for a clinic and meet and greet with number one American ATP player, John Isner. Stop by Village Stage as the Bryan Bros. Band are joined by Counting Crows star percussionist Jim Bogios for an electric performance under the lights. Bank of the West will donate $10 for each participant at its Artistic Aces activation on Friday, March 8, with proceeds benefiting #HeForShe, the United Nations global solidarity movement for gender equality. Create your unique ‘In Full Bloom’ self-portrait at Bank of the West’s Artistic Aces activation as you show support for International Women’s Day. Join us for Masimo Day and catch all the exciting WTA Round 2 and ATP Round 1 action during the first weekend of the BNP Paribas Open.